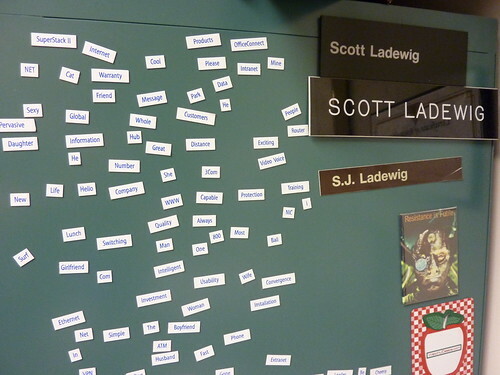 Office Stuff 9 – Project 365 Day 70 a photo by Ladewig on Flickr. The ninth in a series of photos looking at the awesome stuff I have in my office. Here we’re looking at the side of my filing cabinet. The phrases are from one those magnetic poem kits except this one is from 3Com back from SuperStack switch days. The name plates are from (top to bottom) from my offices at VisionAire, Dow Chemical, and and Exxon. Plus a Borg magnet my old boss brought back from Vegas (when they used to have the Star Trek Experience at the Hilton).